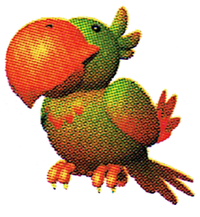 The Talking Parrot is an "item" from Mario Party. It is sold in the Mushroom Shop in the Mushroom Village for fifty coins. After being purchased, it is sent to the Option House. Every time the player selects it, it says a random quote from the vast variety of voices in the game. However, this is not a sound test, for players have to press the over and over until they get the sound they wanted. This parrot is only for show and a good laugh. A similar object is the Parrot Box that comes from Mario Party 3. Both of these objects are similar except that the player can now pick a certain character voice instead of just finding the voice from the Talking Parrot and it can be used free.